South and night events under floodlights are also very popular with members and visitors. 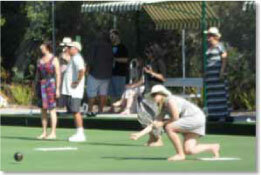 A different program operates in winter with much greater emphasis on social bowls. Whether or not there are organised events in progress, rinks are usually available for personal practice or private games. The exception is Saturday afternoon during Pennant season when the greens are fully utilised. We have a panel of accredited bowls coaches who offer their services free of charge to all members regardless of standard. This is vital for continued improvement and enjoyment of the game. In addition, our coaches provide free lessons to prospective members to help them decide whether bowls is the right sport to take up. 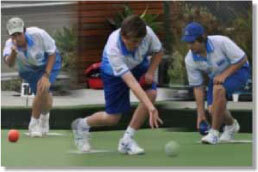 Our club is affiliated with Bowls Victoria. We field Pennant sides on Saturdays (7) and Tuesdays (7) as well as Wednesday night Pennant sides (1). That’s an amazing total of 15 sides currently but we are still growing. We have been very successful in Pennant competition in our relatively short Club history with our teams consistently rising through the ranks to reach high divisions. Season 2017/18 is fast approaching with practice matches scheduled throughout September the club is keen to get a flying start. Anyone interested in knowing more about our pennant program should contact club coach Lloyd Iaccarino on 0434621785. New bowling members are always warmly welcomed into our Club. It doesn’t matter if you are a highly skilled experienced player or a complete novice; we know our Club can meet your needs. Don’t delay - with a clear trend towards younger players, the earlier you start playing bowls the better it is!